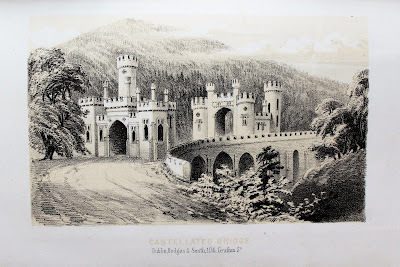 This fantastic structure was built by Kiely on part of the avenue which was intended to lead to a large Neo-Gothic castle which was never built. The castle was intended to surpass that of his brother John at Strancally Castle. During the Famine Kiely evicted many tenants which earned him a bad reputation as a landlord. An assassination attempt was made on his life. In 1903 the house was acquired by the Hon Claud Anson and his wife Clodagh and sold by him in 1930. The lodges and bridge fell into neglect and the main house was demolished. The lodge and bridge are now a major tourist attraction in Lismore.